➢ “After The Handmaid’s Tale, author Margaret Atwood’s big year in TV continues with this quietly mesmerising adaptation of her 1996 novel, which was based on the true story of a 19th-century Canadian housekeeper convicted of a double murder after a sensational trial … The story comes to the viewer in complex chunks and unsettling layers, as Grace reluctantly recounts her dirt-poor immigrant childhood and the circumstances that led to her fate. Innocent or guilty? There’s much more to it than that.” — The Washington Post. 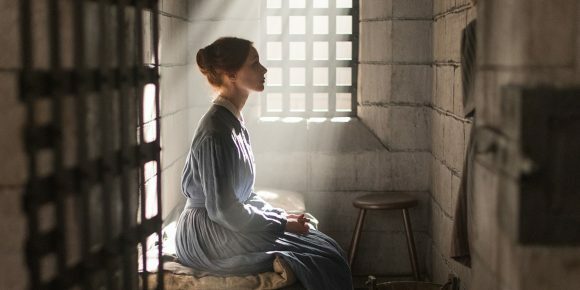 ➢ “Alias Grace presents a remarkably faithful and dazzlingly complex portrait of servant girl Grace Marks (Sarah Gadon), a real-life ‘celebrated murderess’ who was found guilty and imprisoned, at 16, for the killing of her master and mistress. The details of what exactly happened cannot easily be summarised, because questions remain to this day — about her intent, her involvement, and the story’s primary concern, her character. Alias Grace is an attempt to understand her, but the viewer will likely find, by the end, that that attempt raises more questions than it answers.” — Variety. ➢ “Alias Grace isn’t overly brutal. It’s an exquisitely woven fabric with blood staining the corners. The violence is often in the language, as when a servant woman describes a death scene — the result of an illegal abortion — as smelling like a butcher shop … Above all, Alias Grace is about how men abuse power over women, and how that power is always present, even when the men aren’t.” — New York Times. ➢ “Anna Paquin features heavily in later episodes and does a couple interesting things with a prickly character whose version of female empowerment isn’t very likable. And while Cronenberg doesn’t have much to do here, the show wears his presence like a Canadian badge of honour, as it darned well should. This is a very, very Canadian show.” — The Hollywood Reporter. ➢ “Atwood’s commentary has a softer touch than Handmaid’s, and the two series reflect that. Alias’ focus remains the plight of women without rights, but its seen through the lens of a woman discovering she has power, not one who remembers a time when she did. It is not just that the women of the story are oppressed, it is that they (and especially their sexuality) are feared and reviled. Questions of who is good, who is evil and whether or not it matters are constant themes.” — USA Today.